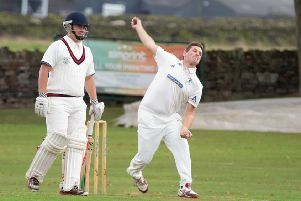 Danny Radcliffe won the Halifax League Merit sponsored by Briggs Priestley Engravers at Elland WMC on Sunday. He defeated Trevor Hargreaves by 21-4 in the final. Both finalists were affected by the failure of three qualifiers to turn up, both going straight into the quarter-finals. Radcliffe began with a 21-7 victory over David Hemsley. In a game of two halves he found himself trailing by 17-10 against Clive Austin but then finished with a break of 11 to run out. Hargreaves faced a similar situation in his quarter-final against David Ryding. Ryding opened with a break of five and extended his lead toseven points at 17-10 but scored only one more single as Hargreaves finished strongly. In his semi-final, against Tony Bannister, Hargreaves was behind by 3-4 but went ahead with break of 10. He went on to reach all-but with Bannister on 7 but had to hold off a late fight back his opponent who reached 16 before Hargreaves managed to get that vital single . In the final, Radcliffe dominated from the start. He opened with a break of six and finished with a break of nine to claim the Wilkinson Sword Trophy by 21-4. First round scores: D.Radclffe w/o v M.Grace, D.Hemsley 21 J.Williamson 18, K.Bannister 11 J.Hamer 21, N.Slattery 20 C.Austin 21, D.Ryding 21 S.Bridges 15, T. Hargreaves w/o v P.Holroyd, A.Gallagher 7 T.Bannister 21, G. Bradford w/o v S.King. Quarter-finals: Radcliffe 21 Hemsley 7, Hamer 12 Austin 21, Ryding 18 Hagreaves 21, Bannister 21 Bradford 6.